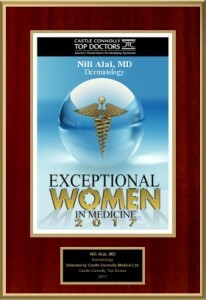 Dr. Alai was selected by her peers as an outstanding practicing doctor in Southern California. After an extensive nomination and research process conducted by MSP Communications, the results were published in Southern California Super Doctors®, a special advertising section in the January 2016 issue of Los Angeles magazine. The Skin Center is a full service, comprehensive dermatology, dermatologic surgery, pediatric, cosmetic, and laser center. Our physician providers are all Board Certified by American Boards. The Skin Center is dedicated and strives incessantly to provide outstanding, standard of care medical, surgical, and cosmetic services for all of our patients in a comfortable and professional environment. Our practice philosophy has always been and remains to treat our patients as we would like ourselves and our families to be treated. We wholeheartedly believe that patient education and informed knowledge are the cornerstones of excellent medical care and in that light, we routinely provide all patients with extensive literature, brochures, and in-office education. Our healthcare team is trained to treat all patients the same, and all with respect and empathy. Further, shared decision making and informed consent are the cornerstones of our practice whereby patients choose their treatment and care. We feel very fortunate and blessed in having extremely wonderful patients who actively choose us for their care for these very same reasons. We will strive to continue to provide outstanding dermatologic care while providing exceptional customer service. Hear what our patients have to say about our dermatology services. America’s Most Accomplished Women Physicians.